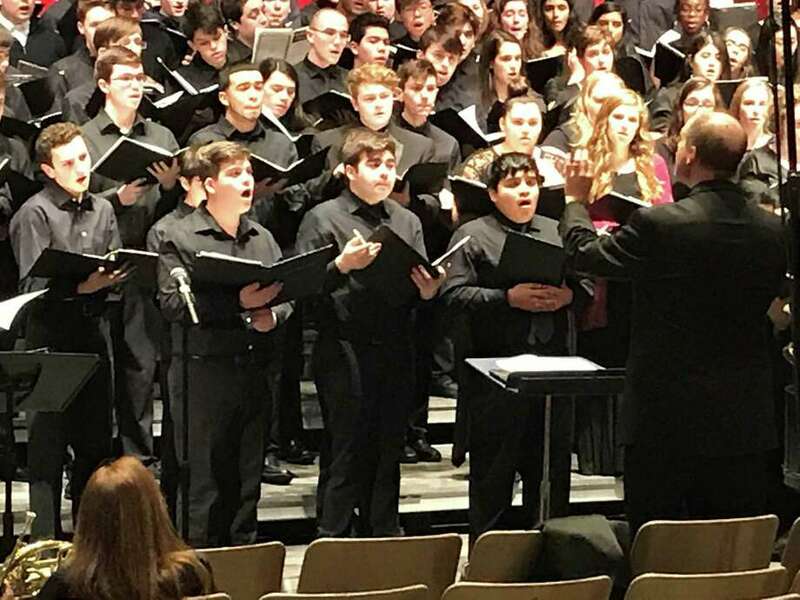 Connor Sainz, second from left, of New Milford and a student at Marvelwood School in Kent, recently participated in the Northern Region High School Festival Chorus, sponsored by the Connecticut Music Educators’ Association. Marvelwood School in Kent has announced Connor Sainz of New Milford recently participated in the Northern Region High School Festival Chorus. The event, sponsored by the Connecticut Music Educators’ Association, was held Jan. 19 at New Britain High School. Connor is in the choir and show choir, and takes music as a class where he is learning piano, guitar, and music theory, at Marvelwood. Directed by Jack Pot, the 200-member chorus sang “My Song” by Eriks Esenvalds & Rabindranath Tagore, “Alleluia” by Paul Basler, “Five Hebrew Songs” by Erik Whitacre and “Der Abend” by Johannes Brahms. Connor, who sang as a tenor, enjoyed “Alleluia” the most. It was my favorite song because of the crescendo and decrescendo, and the very very beautiful forte,” he said. Marvelwood music teacher Jennifer Moros worked with six students in preparation for the audition for the festival. “Just the process of going through the CMEA Regional Auditions is an incredible learning experience and I was incredibly impressed by the students who prepared with me in September and October for the audition,” Moros said. “They all went through a very challenging and rigorous process,” she said. Over the years, Connor tried many different band instruments but decided that singing was his thing. At Schaghticoke Middle School, Connor sang soprano in the choir. He has done musical theater at TheatreWorks in New Milford. Connor looks forward to auditioning for the All-State Chorus this month and hopes to be selected to perform at the Festival in April.